I bought my inverter (a large UPS) 3 years ago specifically because it could run from the Prius' traction battery, but I ended up buying FLA's instead and never hooked it up to my wife's Prius. Fast-forward to this recent thread about doing the same thing with a Volt, which gave me the kick in the pants to finally try it. I need to buy a few parts first - O-ring lugs, washers, nuts - before I can dig in and make the connection to the battery, but my Saturday is looking wide-open so I hope to do it then. According to info from http://www.priups.com the Prius can supply 3 kw continuous, with a surge of several times that. The limitation isn't electrical, but thermal. It expects to be moving down the road when its doing more than just topping off the battery to keep the air conditioning system and 12 volt systems going. My inverter can do 6 kw, 12 kw surge, so its compatible, and my loads are always well below 3k unless I plug in my vacuum cleaner. The Prius keeps the traction battery between approximately 210 and 235 volts, which is also compatible with the inverter specs. Since the inverter is already hooked up to most of the 120 volts circuits in my house all I have to do is unplug my battery bank and plug the Prius in its place. It could even work in tandem to keep the battery bank charged but I want to run tests to see what the current curve looks like before I'm comfortable leaving it unattended... the Prius is designed to recharge NiMH and not FLA, plus it isnt expecting to be attached to a 22 kw battery bank, only slightly over 1 kw... lots of potential to let the smoke out in a big way. Anyway, the connection should be easy so hopefully I'll be up and running by mid-day. Then I'll probably go fill up the tank and let it run for 24 hours to see how much gas is used. I'll report back. Be sure to leave the garage door open! Hey! Don't forget to take pictures for us!! Why would you want to use up battery cycles for something like this? Planned on pics, no problem. What battery cycles? This test won't include my FLA battery bank, its going to be Prius-only. The traction battery gets a hundred cycles up and down each time the car is driven so I'm not worried about cycling that battery. I do want to know how long the gas tank is going to last me with my typical loads - only way to do that is to "just do it". Not to mention I knew some here would be interested in the same info. I won't be running my FLAs in tandem until I get some current readings in/out of the existing traction battery. Which won't be until later. The operation and output of the generator is likely highly tied to the Prius NiMh batteries with computer controlling the regulation process. It may not react well to an external battery load. It may have undesireable consequences like generating a failure alarm (like thinking battery pack is defective) requiring trip to Toyota service center. I would do a lot of research on the web to see what issues may happen. You may want to look at Hobbit's site: http://www.techno-fandom.org/~hobbit/ . Somewhere in there I'm pretty sure he's calculated about the fuel consumption. If not, then you might be able to contact Bob Wilson, who used to be on Priuschat, but isn't any more, but he has posted this project: http://hiwaay.net/~bzwilson/prius/priups.html . That was only a 1kw draw from the regular battery circuits though. There is more information from him here: http://hiwaay.net/~bzwilson/prius/ . I'm pretty sure the consensus is that the Prius is a great generator, much cleaner than the commercially available ones. Oh, and while it is of course prudent to not tempt fate, it seems years and years ago somebody calculated that because the Prius burns fuel so cleanly and would only be running intermittently, it would be difficult/impossible to die from carbon monoxide poisoning if you left it on in an enclosed garage. Of course, if you're pulling current from the car, the engine will run more often, with more CO produced. Looks like the Prii used on both of those sites are the generation prior to mine so the results wouldn't be directly applicable. The battery capacity is smaller and the engines were a little less efficient. Born out by the official mpg numbers which if I remember right are about 10 mpg lower. I read somewhere it will run 3-5 days on one tank while serving in "generator mode" (wouldn't it be nice if that mode actually existed - with a built-in 120/240 inverter and a twist-lock outlet somewhere outside...). My tank holds ~8 gallons, useable, which works out to about 0.11 of a gallon per hour over 3 days. Not as good as the 1 or 2 kw Honda inverter-gensets (but only by a little! ), about the same as the Honda 3 kw (which is the best comparison looking at output), way better than contractor specials and a heck of a lot more efficient than my Generac. Stretch the run time out to 4 days and it almost beats the 1 kw Honda. I've been running a good chunk of the house from the Prius since 7 tonight. I dug into the project at around 10:30 this morning, it really didn't take all that long to get in and even less time to put all the pieces back together. In-between, though, I had to deal with a DirecTV tech who kept blaming the complete failure of my system to old coaxial and wanted to bail... wirint which worked fine for the last 7 years we've been in our house. He replaced the LNB and claimed he verified the output of the multi-switch in the attic... but after I finally demanded that he replace it, it became obvious he never did his job because suddenly everything worked fine again. Sorry for the rant. I also watered my battery bank, ate dinner, spent some time at Home Depot and spent a lot of time staring at my voltmeter verifying the high and low voltage points in the Prius on/off cycle. So believe me it didn't take 8 1/2 hours to hook up the wires. I took lots of pics, but I have to resize and upload them so I'm going to skip the step-by-step for now. I'm tired! I will post some of the details I found from my tests. After getting the connection in place I decided to use the high beams and A/C on high as a test load. They were effective since I got it to cycle high-low-high fairly fast but I encountered one problem which worried me at first. Every time the engine started the voltage would briefly drop very low and then eventually would end up spiking around 300 volts for a few seconds, after a few minutes. Hardly the 210-235 range I was expecting! I finally came to the conclusion that while the A/C was a good test load from an amps-used standpoint it was most likely causing my erratic readings. Time to jump all-in and hook it up to my inverter. In the past I tested what would happen if I disconnected the battery bank and the charger/supply voltage shot up from 220 to 340 volts without causing the inverter to fault offline so I figured that even if my odd 300 volt readings were real it wouldn't do any damage. So I hooked up the inverter and ran a test load for a half-hour, a large space heater. My Kill-A-Watt says it was using 1430 watts. Roughly half of what I can take continuously from the Prius so a good test load. After the on/off cycles stabilized I was seeing the engine come on for around 2 minutes 40 seconds, then off for 4 minutes 50. Going by the voltage readout on the inverter the battery voltage went down to 200 volts, the engine would start, the voltage would slowly climb to around 244 volts and the engine would shut off. I would see a brief drop from 200 to 190 volts when the engine started - the traction battery and one of the 2 electric motors is used to start the gas engine so I expected a bit of a voltage drop. I worried this would cause the inverter to drop out but it didn't. Its an intelligent unit so it must look for a sustained low-voltage condition before faulting. The readout on the inverter showed the battery amps going from 7 amps at the highest voltage to 9 amps at the lowest, expected with the voltage fluctuation and the inverter's own energy needs. I did notice that the cooling fan on the Prius kicked on a few times even when the engine wasn't running - I assume this was due to the battery's cooling system. Everything is still working fine, its been going for 3 1/2 hours now with no hiccups or oddities obvious from my couch. I'll let it go overnight probably putting about 15 hours on it. Hope to get the pics up tomorrow. A good run last night, 14 hours and I put 2.8 gallons back in the tank. Works out to 0.2 gallons per hour, comparable to the Honda/Yamaha inverter-gensets. I figure it had about a 1500 watt-h load for 4-5 hours last night, then around 200-300 watt-h overnight, then around 500-600 this morning for an hour or two. Normal loading, no conservation. The only gotcha is I forgot to turn off the Prius' A/C, which was set to 72 and it got down to 65 last night. So there was probably a minimal heating load early this morning. Not enough to skew the results much. Yes, a new Prius battery is $4k from Toyota. From other sources its $1k. And you can rebuild it yourself for $500-700. As I said above, the battery cycles a hundred times every time its driven, more for long trips. I estimate it was cycling 4-8 times per hour, closer to 8 last night, closer to 4 overnight. Total cycles less than 100 for a half-day. Even if its used as a generator a dozen days over its lifetime it will be an unmeasurable amount of cycles compared to normal use. The floor and storage tray, removed. No tools required - I'm sure they make it quick and easy because this exposes the battery disconnect. Firemen can get to it quickly on an accident scene. The battery pack fully exposed, it only took 2 bolts to get here but after this point it gets harder. Intentional I'm sure, because your average Joe won't - and shouldn't - do this. Getting the support bracket off of the left side requires tracking down 7 bolts. 4 are easy, 2 are hidden behind the seat cusion, one is hidden behind the trim near the left-rear door jam. The safety disconnect, to be removed before you take off the cover over the battery terminals. You can do it before you remove the support bracket if you want. Where it peeks out on the left you have to feel near the top, lift straight up then swing the lever down. Then the whole assembly will pull out to the left. Then dig in above the 12 volt battery (not shown, its at the right-rear corner of the car) and disconnect the negative connection where it is attached to the car body. BIG NOTE about the HV battery disconnect - it has 2 connections. The small one doesn't always make a good connection and you have to reach underneath with your finger and press the connection together. If it doesn't connect you'll get a ! warning when you try to start the car, don't panic, just fiddle with the small connection. If the car will then start but you still have a ! disconnect the negative wire on the 12 volt battery again, which will clear the error. The cover over the battery terminals, removed. I couldn't get one of the two small bolts to let go so I just bent the cover up. Closeup of the terminals. The ones on the right are normally covered by plastic tabs and are live if the battery disconnect is in place. The left side are only live when the relays kick on when the car "starts". This is where you should connect a tap because if something goes wrong all you have to do is turn the car off and everything is dead. The white and black wires are my addition, O-ring lugs with 10 gauge wire. I bought 4 feet of 3-conductor stranded at the big orange store and a standard 15-amp outlet. A 1430 watt heater as a load, this is the battery amps/volts as shown on the UPS. The cable stores in the left-rear storage compartment. Lots of holes in all the parts from the factory so no need to cut any holes or make any modifications. Just so its crystal clear - the voltage available from the Prius traction battery is roughly equivalent to the 240 volt AC supply available in your house (AC voltages are expressed as the equivalent DC voltage to do the same work, but really 240 volts AC briefly spikes near 340 volts). If you touch the terminals in your dryer's outlet it will hurt but you will probably be OK because AC tends to throw you off. If you touch the DC terminals in the Prius it will hurt and you may not be able to let go. Which can lead to something more dire than just hurting a little. This procedure can be dangerous. Adding this homemade tap can be dangerous - even after putting all the parts back together. It could void your warranty. It could damage your car. This should not be attempted by beginners. I don't take any responsibility. That said, many have done it, and it can be done safely. I decided to use a standard 15 amp 120 volt outlet like the guy on priups.com did, because then I could easily use a 12 or 10 gauge extension cord to make the run to the inverter. 12 gauge, 50 foot run, 3000 watt load which is 15 amps @ 208 volts is only a 1.4% drop. If you want to be sure people can't plug something into your tap you could go with one of the specialty plugs available at the orange store, a good option would be a twist-lock assembly. Then you would have to make an adapter to use a standard extention cord, or make your own extension cord. How much heat does the restarting, cause to the starter motor ? Does it need moveing air from driving to keep it cool ? The Prius has two electric motors, one is fairly small, the other one is larger and is the primary traction motor. The smaller motor does double duty as the gas engine starter, and generator. I know the battery and internal inverter system (converts DC to variable frequency AC for the motors) has a cooling system, which I'm sure is why I heard the electric cooling fan under the hood kick on even when the gas engine wasn't running. I don't know if the electric motors are part of that system or the engine's cooling system but I'm sure they have some kind of cooling system. I doubt they need moving air because you can sit indefinitely in park with the A/C on (which has its own inverter and also uses the traction battery) and the engine will cycle on/off about as often as it did with my test load. A quick update. I started another thread asking about the APC Powerchute software, which digressed into a parallel discussion on a center-tap transformer and other stuff. Thought it would be a good idea to link back to it here. So with the model you have you connect each of the 4 strings separately to the UPS and then it combines them internally for a higher voltage? Yes, there are 4 strings of 8 batteries each, which plug into the UPS individually. Continuity tests confirm they are in series, plus I found the two end-points of the string which measure 434 volts at full charge. I considered using some Vicor DC-DC converters (they have a 300-to-48 volt 500 watt isolated converter that can be paralleled with others) to boost the source voltage and simulate two of the strings, while using the source to simulate 2 of the other strings already in series... but just connecting at the two end points won't let it start up. Its detecting each string AND using a mid-point tap for internal use (bad design!) so I would have to simulate all 4 strings. That's a lot of converters. Plus it would still be half-useless to use with my house battery since backfeeding while plugged into AC might ruin the converters and definitely wouldn't charge the batteries. Much easier to just start over with a smaller model that might solve all the problems at one time and be more portable. Its possible the smaller ones might detect 2 individual strings but I think its unlikely, I'm betting they just series them and use the 192 volts nominal. Same 192 volt external battery packs as the bigger models, and it allows hot-swapping so the internals must run on 192 to allow the internal batts to be pulled. With only 2 strings and no lower-voltage tap logic says there is no need for string detection. If it does, I can use 4 of the Vicors to simulate 2 strings on the internal connections during startup while supplying the source to the external connections. Then drop the Vicors and apply my AC load, leaving only the external connection as the DC supply. I may have finally found a good candidate to replace my big APC. Waiting for the auction to close... then shipping... then the testing can begin again. I'll resell the other APC - first dibs to anyone here that can use a 8 kw/10 kva UPS. The batts aren't in great condition so I'll keep them for testing then I'll recycle them. Well as a long time off grid guy, this is pretty amazing, and darn cool, but in a sense. there is nothing new under the sun, and this has already been done. All a bit antiquated now, but when you think about it, there's not too much difference between the two. Congrats on making it work, and the fuel efficiency is stunning, but I wonder what the REAL cost per KW is. Well, one difference is that an alternator won't put out its rated amperage at idle, maybe 10%. Then even if you are running at full bore with a specialty 200 amp alternator you'll still get a max of ~2400 watts. Most alternators put out half of that. At idle you'll probably burn through an 18 gallon tank in 24 hours, at full throttle just a few hours. Workable for the short term. Volt looks like it will make a pretty fair emergency power source. The DC to DC converter outputs 175 amps so a 1000watt inverter should be ok. Yes, the built-in converter on the Volt has lots of headroom. 1000 watts would be more than enough to keep a fridge stable, a TV going, and a few lights on. With its larger traction battery you might be able to tap it for more than the 3000 watts (6000 surge) you can get from a Prius. Always a monkey with a wrench in the works... so after running some tests this weekend it looks like the charging circuit doesn't work in the UPS I just bought. Not a problem if I only used it with the Prius, but this was also going to be my new primary inverter at home (keeping my old Liebert as a backup). So it must be able to charge my house battery. Luckily the seller is only 15 minutes from where I work so they are going to take it back and runs their own tests to be sure. If it is bad they are offering to swap it with a similar slightly larger unit (SURT6000XLT), for a price of course. I figure if their "upgrade" price is reasonable I'll bite, then offer them a lowball price to buy back this one and then only use it with the Prius. It inverts from battery just fine so it would be perfect. Success. They gave me an even trade for the larger SURT6000XLT and didn't make me wait for them to confirm the 5000 had a problem. I have a meeting tonight so no tests on the new unit until tomorrow. I hate getting new toys and not being able to play with them. The latest addition in action. The small plug on the left is the tap from the Prius' battery, the big plug is the utility connection - obviously unplugged here. 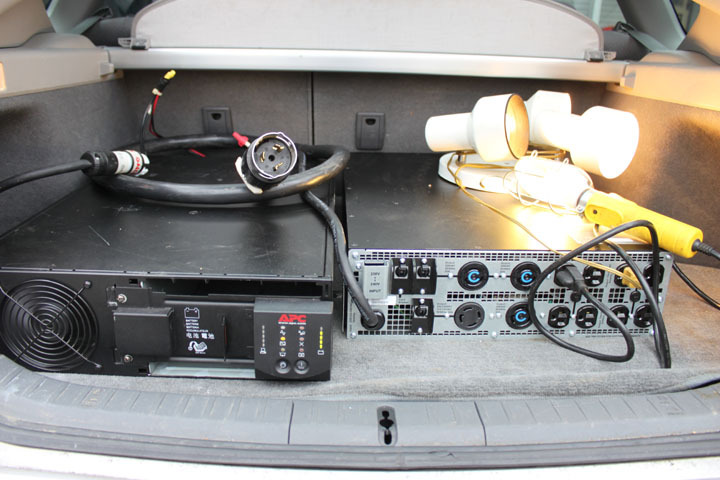 For reference, the following APC models are compatible with the DC output from the Prius, no modifications (to the UPS) necessary. There are many sub-models with various letters that come after the numbers above (such as the SURT6000XLT), and most only output single-phase 208 (or 240) volts. There are 2 rare models which will output 120/240 natively, but don't expect to get a cheap deal on Ebay. I don't have the model numbers handy right now. The 5000 models are most closely compatible with the Prius on the AC side, with 3500 watts of continuous output and 5250 watts of surge for 10 minutes. You see a second black box in the photo above, which is a step-down transformer which takes the 208 or 240 and outputs 120/240 split-phase. It is the APC SURT003, which you can also get for a few hundred bucks on Ebay. Edit: one detail I forgot to add, I opened up the Prius again to double-check the tap connections. I wanted to be sure the nuts hadn't loosened, and to add some glue to be sure they wouldn't. I timed myself this time, and it only took 45 minutes to get in, add some glue and put it all back together again. Without experience you should plan on an extra 15-30 minutes. Another data point. I ran another test last night for 12 hours using the new UPS. This time I remembered to turn the car's A/C system off, plus I turned off the touch screen and the radio. Same routine in the house as the last test - 3 hours with TVs, lights, 2 fridges, 1 freezer, wood stove blower, and various minor loads. Overnight with fridges/freezer/minor loads, then an hour this morning with the same plus some lights and an electric heater. Impressive results this time. 1.6 gallons of gas used in 12 hours, about 0.13 gallons per hour which puts it dead even with the smaller 1 & 2 kw Honda/Yamaha inverter gensets. It would run continuously for 2.5 to 3 days on one tank of gas. Just bought a SURT3000XLT without batteries but I will not get it until later next week. If I understand correctly the traction battery is wired in directly where battery used to be connected. I have been unable to find any pictures or explanation of this step of the PriUPS wireing. It looks to me that a simple 240v to 120v 3kw transformer should suffice (less than $100) for the step-down if no more that one 120v outlet is needed. Welcome to the forum Rolf. Look forward to more information from your experimentation/install.